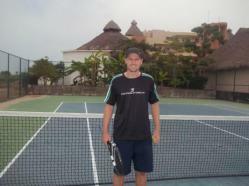 El Palmar Beach & Tennis Resort is pleased to welcome an Australian tennis pro to the Cihuatlan area. Ben comes to us with 10 years of teaching experience at the pro level. His expertise and specialty is in the Mental Art of Tennis. Something that can benefit all parts of our life. No more berating the linesmen, or breaking your sponsors racquets! Tennis Mental training gives players the chance to become holistic in mind and body through meditation, and education specific to tennis. It offers students of all ages the ability to learn tennis Technically and Mentally. Currently hosting a number of professional players, anyone of any standard is welcome to learn tennis the smart and enjoyable way. Visit School of Tennis to see more information about Tennis Holidays and Academies. The School of Tennis is based in Queretaro, near Manzanillo on the Pacific Coast of Mexico. A great way to improve your game during your Mexico Tennis Vacation and we can make all the arrangments for you to meet and train under Ben. Rosie and I are very excited to offer our El Palmar guests this wonderful opportunity! It was great fun to meet other people who enjoy tennis.